I love to organize my jewelry in pretty dishes. 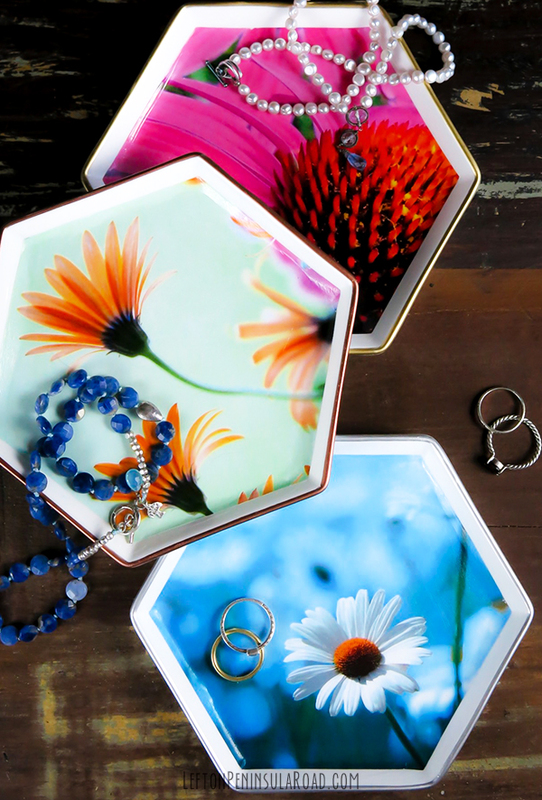 So, when I found these cute little hexagonal plates, it seemed like the perfect opportunity to make some trinket dishes with a personal touch using some of my own printed photos and decoupage medium. On the nightstand or next to the sink, these pretty jewelry catch-alls come in handy anywhere. Last month I shared this quick decoupage craft over on Landeelu. These simple trinket dishes are easy and inexpensive to make. Make a few extra to keep on hand for gifts. You could even try some seasonal images for the holidays. Start by selecting your images. 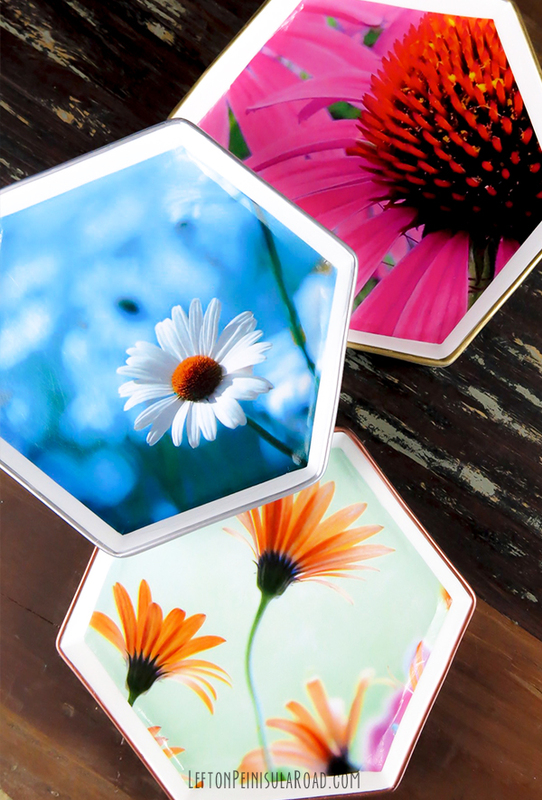 I chose three bold photos of flowers I had in my photo collection and printed them using a laser printer. I recommend using a toner-based printer or having images copied at your local copy center to avoid smudging when you apply the decoupage medium. I use this Canon laser printer at home. Trace the shape of your dish onto the image. Cut the photo to fit your shallow dish or plate. Follow instructions on your decoupage medium. I used dishwasher-safe Mod Podge so I could use one of my dishes next to the sink without worry. After the decoupage medium dries, use a metallic leafing pen to accent the edge of your dish. Clockwise from the top, the edges are gold, copper, and silver. I think the metallic paint adds the perfect finishing touch. Wasn't that easy? And I am going to make it even easier for you. Download my flower images and you won't even need to look for photos. I loved putting these cute little dishes together. Experiment with different photo and dish combinations. These bright close-ups have a bold graphic look, but it would be fun to try some black and white or sepia-toned photos for a completely different effect. Or how about making a matching glass tile photo pendant to give as a gift? I think I'd better go buy more little dishes! This easy decoupage craft was originally shared with Landeelu readers on July 27, 2016. That is such a cute project! They would be great to make as Christmas gifts this year! 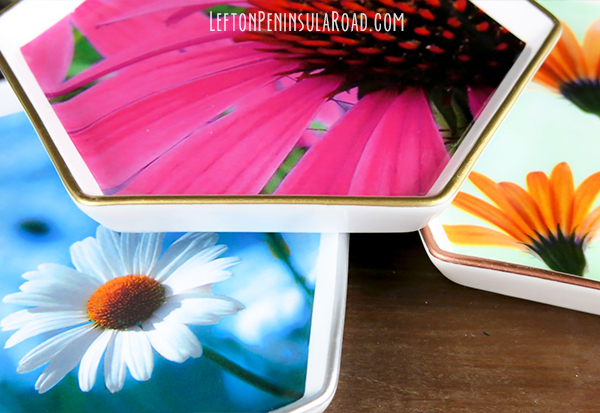 I love how beautifully your trinket boxes turned out. So effect and useful. Thanks so much for sharing. These are absolutely stunning! Such a pretty way to organize your jewelry pieces. So pretty and your flower photography is excellent! Thank you so much Patti! These are so lovely, and perfect for gift giving as well. I am in love, what a great and beautiful project! on my bucket list! How sweet Maria. Thank You! These are fantastic! I love the colors of the floral pictures you used. I need one for my new master bathroom counter so I have a place for my ring. Logo & Photography by Laura K Jones ©2013. Powered by Blogger. Left on Peninsula Road is a participant in the Amazon Services LLC Associates Program, an affiliate advertising program designed to provide a means for sites to earn advertising fees by advertising and linking to amazon.com. Thank You! Visit Laura | Left on Peninsula Road's profile on Pinterest. All of my content is copyrighted. If you would like to feature my work, you may use ONE image with a link back to that post on my blog. 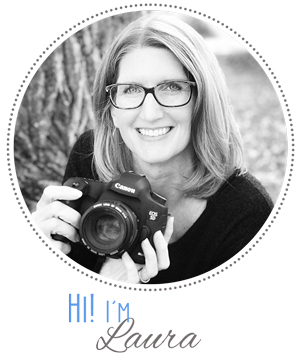 You may not edit, crop, or otherwise change my images without written permission. © Left on Peninsula Road. All rights reserved.